Today I am writing a little about my host here in Germany which is called the Gesellshaft für Bauen und Wohnen (GBH). Yes that is quite a mouth full. Let’s translate that to English and try again. The Society for Building and Living would be the direct translation. Let’s simplify that one more time and say that GBH is the social housing company for the city of Hannover. I will not go into the structure of social housing companies in Germany because you can read through my other blogs to figure that out. GBH owns and operates around 13, 356 housing units in the city of Hannover. GBH employs around 150 people but contracts out a majority of the maintenance department. I am impressed at the number of new developments constantly being constructed by GBH but wanted to highlight the housing for refugees today. In my last blog, I wrote about the refugee crisis in Germany and how social housing companies will need to play a major role in helping ease the housing crunch. I asked a colleague of mine Herr Robert Kulle for more information about GBH’s housing for refugees and he politely helped me. I should mention he has always been extremely helpful and does not become offended if I call him by his first name or forget to use the more formal (Sie vs. du) when speaking to him in German. (Sorry for digressing back to my continuous battle with the German language.) Anyways, GBH is taking on its fair share of housing projects for refugees and I thought I would highlight today what their involvement looks like. One must note that this is happening throughout Germany and construction projects are popping up all over the place in the attempt to meet the housing need. I counted together 10 different projects either completed, in construction or in planning. The projects are of differing size and variety but show a commitment to working with the city on developing refugee housing. I see two different types of housing being built. One is called Wohnheim which is kind of like a communal living setting that is more temporary. The other is called a Wohnproject or a normal independent apartment building. Some of the differences are how the units will be used in the future, options for refinancing and commitments to becoming long term social housing. Enough with the descriptions let’s see what we have. Nothing says results like an architects renderings. Below you will find a before and after picture for a communal living building in the Bothfeld, Eichenweg area. The figures for this building are also below. What is remarkable for this project is the short turnaround time to build it and the lower costs. This willingness to compromise on building quality will allow more units to be quickly constructed. Please do not think that this means the places are not safe, sanitary and decent. They are just made to be a temporary solution. Refugee Dorm: Bult, Janusz-Korczak-Allee: This is another similar project to the one shown before. Again it is not fancy but fancy is not what is needed right now. Safe, decent and sanitary should be our mantra here and I believe GBH is delivering. 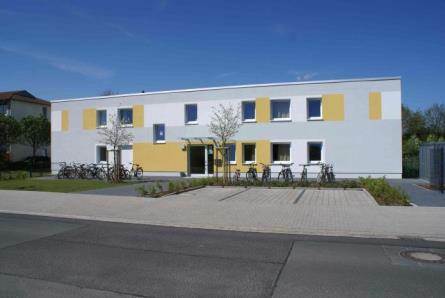 Refugee Housing Units: Badenstedt – Hermann-Ehlers-Allee: If I am understanding this one correctly, these are normal apartments where families can reside. That means they are not meant to be so temporary in nature and will provide longer term relief. The building is still being developed hence the picture below. 3-4 per apartment with a kitchen and bathroom in each. Building Costs. 3,8 Mio. EUR (Including buying space und 380.000 ground preparation) This is another long term project that is currently in development. GBH has many other plans for building in planning in 2015. 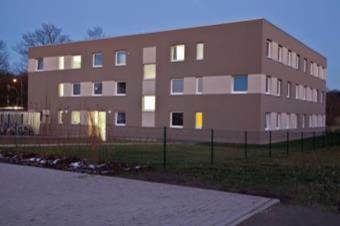 A project at Badenstedt will see 14 new apartments come on line and another in Wettbergen will see 10 units come on line to house around 50 refugees. That secondary one will also have social help on site. 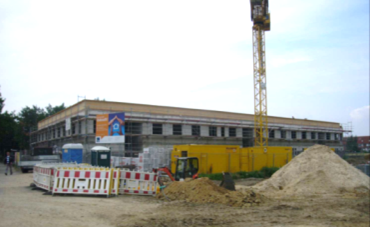 In Bemerode GBH will include two refugee buildings in a project with 5 overall buildings included. 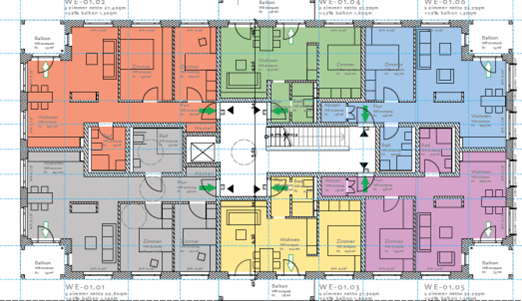 A former fire station property will be converted into a living space staring in 2015 with completion forecasted for 2016. That should provide 14 units of housing. The projects listed are rented to the state capital of Hanover for 10-15 years. Many of the buildings will then go to GBH for updates, renovations and then be rented back on the market. GBH is one of many social housing companies showing not only their commitment to housing those with low incomes in the community but also refugees coming from dire situations. The ability to become more nimble and quick in the building process is commendable not only for GBH but for the city and law makers who are working together to realize quicker build times. I will attempt to bring more stories like this to the forefront when possible.